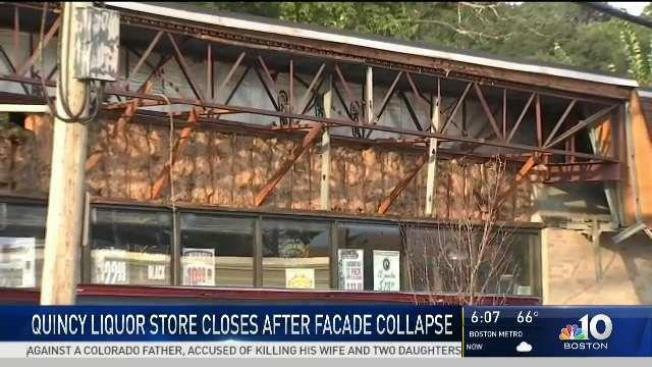 A popular liquor store in Quincy, Massachusetts is shut down after the roof crumbled to the ground Monday night. Atlas Liquor store, located on Adams Street, is closed until further notice after it collapsed. The surrounding area typically sees a lot of foot traffic but miraculously, no one was injured. "Pretty big crash, you know," one witness said. "It was loud. A lot of dust and everything." Officials are still estimating the total cost of the damages and the owner is unsure when the store will reopen. This is the second facade collapse in Quincy within just two weeks apart from each other. In early August, a 40-foot facade came down from a vacant building on Hancock Street.